Not a scale model, I admit, but sort of "scale-ish"! This pretty little 18" sports rubber model was issued as a kit by Frog in 1954 as part of their "Senior Series" range. the plan can be download from my Frog site here. By using light wood, I was able to keep the weight down to 22.5 grams (without rubber), despite there being a lot of sheet in the design, and fairly chunky balsa sections in the wing. The model is covered in white Japanese tissue, and airbrushed with Humbrol enamel thinned with cellulose thinners. The wing lettering was masked and sprayed, and the Frog badge is a home-made decal. I tried to come up with a 1950's era colour scheme, hence the cream and brunswick green. The prop is a 7" Peck plastic item, cut down to 6.5" to match that shown on the plan. I added a spinner using Milliput Epoxy putty, backed with a 1/32" ply disc glued to the rear of the prop (the original kit prop had a moulded-in plastic spinner). The model flew more or less straight off the board, with just a little noseweight and a touch of downthrust. Initially I used one loop of 0.150" rubber, which gives gentle cruising flights, but I have now upped this to a loop of 3/16". This gives a more lively performance with a much improved rate of climb, and best time so far is 58 seconds. The flight pattern is rather variable, I suspect due to the butterfly tail, and the model tends to wander off in whatever direction it feels like! 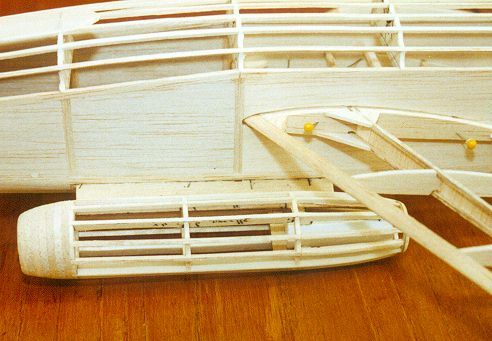 The entire structure was 1/16" balsa, including the fuselage stringers. The first two fuselage bays filled in with soft 1/16" sheet instead of just one. A one-piece tailplane with no hinged elevator was used (I never moved the elevator once on the smaller version). Some extra detail added in the cockpit, together with the prominent gun ports under the nose. 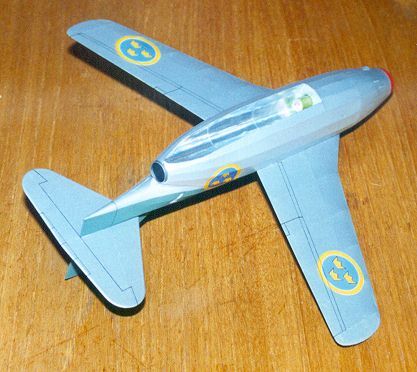 I finished this model in the Swedish Air Force ground attack scheme, just to be different, using Humbrol matt green enamel for the upper surfaces, and Xtracolour "RLM Silber" for the undersurfaces - both thinned with cellulose thinners. The 7 and H are painted, but the Swedish roundels are home-made decals. Although the difference in wingspan is relatively small, the new model was considerably bulkier than the old one, and it looked just the right size for a rapier L2. It weighed 26.5 grams with a new L2 motor, compared to 18.5 grams for the smaller one with a lighter L1 motor on board. The photo below shows the motor trough, with the green Rapier L2 motor visible at the front of it. 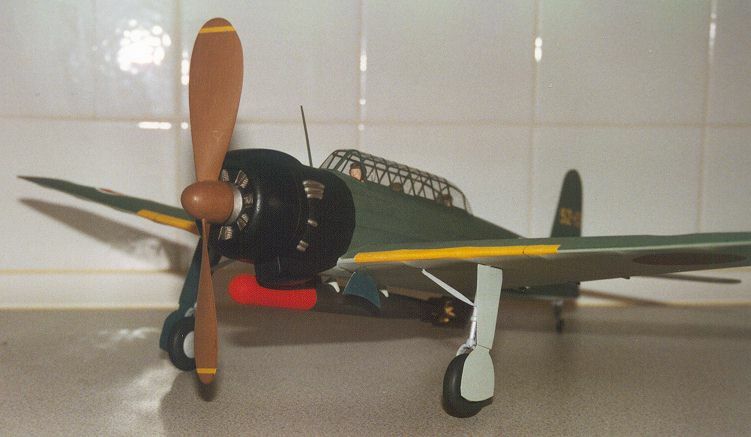 The model flew successfully at a fairly windy Old Warden in May 2002, but next time out in June the motor tube came adrift after a heavy landing, and ended up inside the fuselage. It kept running for about another 10 seconds, with predictible consequences - total incineration of the fuselage. Let this be a warning - always attach your motor mounting tubes very securely, especially if the motor does not have an escape route!! 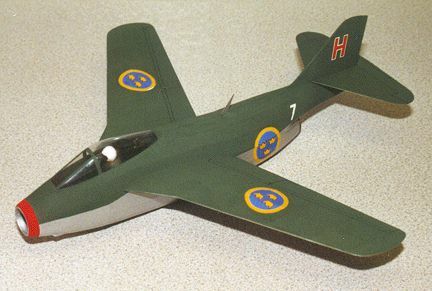 This is the design by Richard Crossley featured in the March 2002 edition of Flying Scale Models magazine. Span is 11", length just under 16" inches, and the model is powered by a Rapier L2 motor. I have not changed anything on the plan at all. I chose to do the later all-white scheme carried by the aircraft, brightened by the fact that the elevators, ailerons and rudder were all initially left in their original red colour, to save having to rebalance them after repainting. All markings are home-made decals, on a gloss-white painted airframe (Humbrol enamel thinned with cellulose thinners). Covering material was Esaki tissue as usual. All up weight with a loaded Rapier L2 on board was 36 grams, including noseweight. 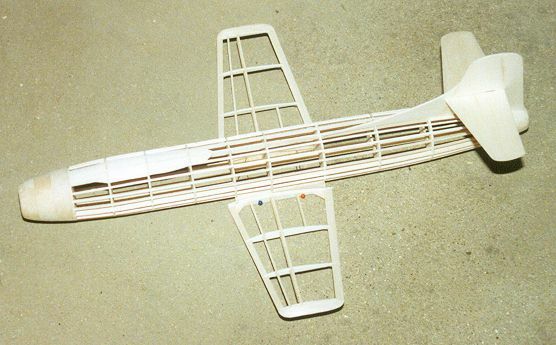 Photo of uncovered model reveals the relatively simple structure, with all-sheet tail surfaces. Wing root fairings were yet to be added when the picture was taken. 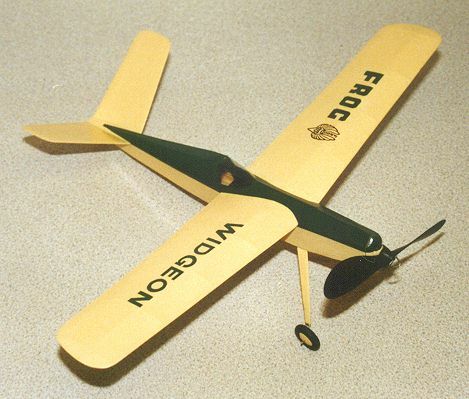 This is another model that I find very tricky to launch - test glides looked good, after a bit of nose ballast was added, but initial attempts at powered flight resembled throwing the model at the ground to see if the wings would break off (which they did). Pure operator error. I have now fitted a discrete catapult hook which I can use when my launching technique is particularly bad. The model made its first successful flight at Old Warden in 2003 during the Scale Weekend, and with a hand launch too (quite amazing). It made a nice change to bring it home in one piece. This is my first attempt at a twin Rapier-powered model. 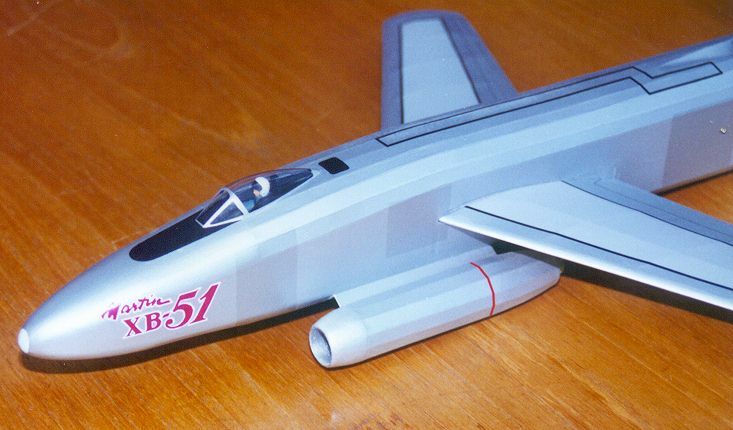 The XB-51 was a spectacular beast which flew all the way back in 1949, and must have looked like something out of a science fiction movie way back then. What attracted me to it, apart from its looks, was the fact that its engine nacelles are in just about the perfect position for a free flight jet model. With a motor in the back of each, the Rapiers are just ahead of the proposed centre of gravity and also Close to the centreline (useful to help minimise the effect of asymmetric thrust). 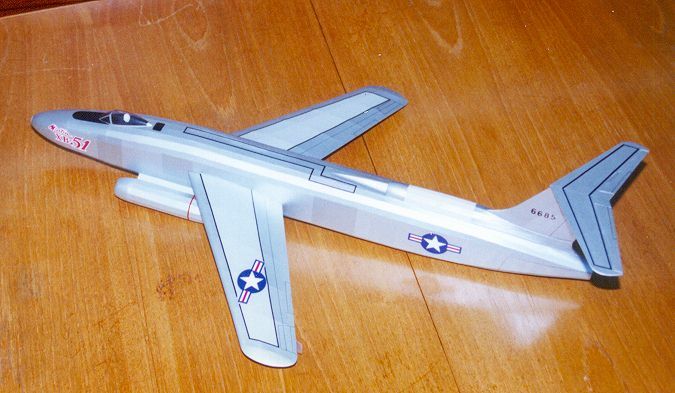 Span is 18.5", length 27" and the wings seem far too small for that huge fuselage. I decided to try to fly it with anhedral on the wings, like the prototype, but unpainted for the test flights, so that if it failed I could rebuild with a flat wing, or even a bit of dihedral. As it turned out, it's second flight, at Old Warden in June 2002, was a complete success, with the model climbing strongly out in a gentle right hand circuit, before turning more tightly as the speed built up (without losing height) then settling into a gentle RH decent when the Rapiers ran out. No nose weight was needed, just a bit of up-elevator to get a good glide prior to the first flight. I also added a trim tab to the TE of the LH wing to keep it straight. It is probably worth noting that I used a crude catapult with a loop of 1/8" rubber to gently launch the model, as it would be impossible to hold it under the wings without getting your hands severely burned! This catapult made launching so easy and reproducible that many of my more troublesome models are also now sporting small catapult hooks. As you can see from this uncovered shot, I tried to keep the weight down at the back, so used a built-up tailplane and rudder. 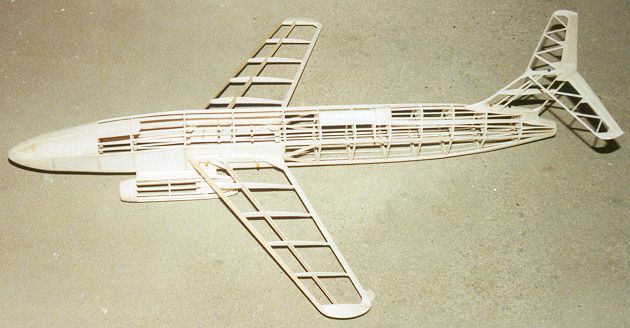 The basic fuselage box from 3/32" balsa can also be seen. Stringers top and bottom are 1/16" square. I used plenty of sheet in-filling at the front, and filled the fuselage sides back to the wings for strength. Here is a close up of one of the engine nacelles. You can see the notepaper mounting tube for the Rapier at the back. The front of the nacelle is made from laminated balsa rings. The design allows air to pass through the nacelle over the motor tube, hopefully augmenting the thrust and keeping things cooler around the motor and jet exhaust. The nose logos were a challenge - I ended up printing them onto white painted decal sheet, then cutting round the block of lettering where I could easily do it, leaving a white border next to the red. For the tricky bits (e.g. around the Martin lettering), and between and inside the letters, I used silver paint and a fine brush to create the white borders. After applying the decals to the model, I touched up again with silver paint to help hide the edge of the decal, as well as painting over some bits that looked a bit blotchy. To get a more realistic patchwork appearance of the bare metal airframe, I cut some panels of decal film sprayed in a slightly darker shade of silver and applied them to the fuselage. This breaks up the uniform silver colour of the large fuselage nicely. The model weighs 50.5 grams complete after painting without motors, and 64 grams with 2 Rapier L2's installed. That makes 32 grams per motor, which proved to be fine. 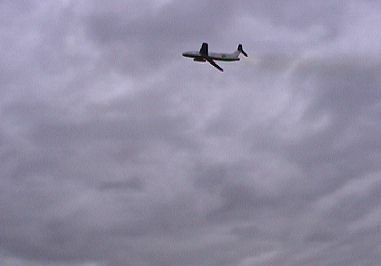 The model has now flown successfully with its final paint scheme, and thanks to Graham Potter for capturing the video footage from which the action shot above was grabbed. The model is extremely sensitive to the position of the small trim tab on the left wing trailing edge. For example, if you have the back of the tab about 3 mm downwards, the model turns right rather too steeply. If you have it level, it goes left rather too steeply and if it is half way between it goes more or less straight for the first half of the flight. Though I say so myself, it does look rather impressive in the air. 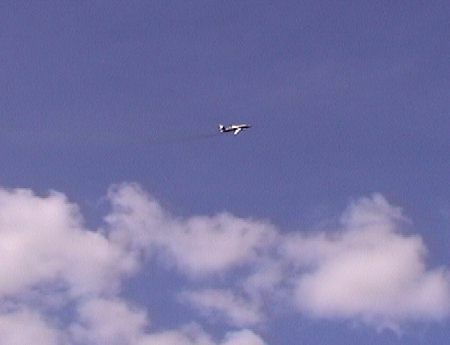 The video still above was taken at the Peterborough Flying Aces meeting in 2002, with the model at altitude on its best flight yet. For the 2003 flying season I decided to try flying it using two Rapier L1 motors, instead of L2's. With L1 motors available with 80 mN thrust, this is not far from a 100 mN rated L2, and you save on all-up weight moving to the smaller and lighter motors. Spacers were put in the motor tubes so that the backs of the L1 motors were in the same place as the L2's had been. 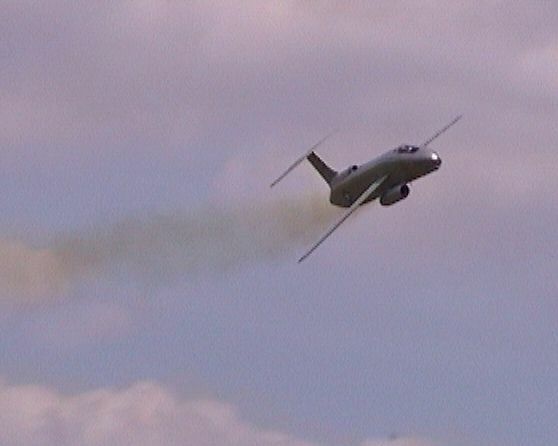 The model was flown in this form at the 2003 Old Warden Scale weekend, and put in one great flight on Saturday afternoon (picture above). There was certainly enough power there, and the rapid acceleration normally seen at the end of a flight, together with the tightly banked turn, was thankfully absent. I managed to crash it on Sunday in breeezy weather, but damage was not too extensive. 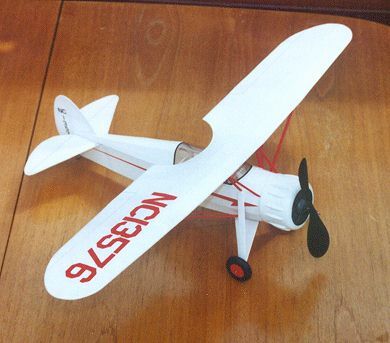 This is a 1/24 scale rubber powered design by Nate Sturman, and was published in the Flying Aces Club Newsletter. The Jill is quite a large aircraft - a torpedo bomber with a crew of 3, and the span is an impressive 24.4". 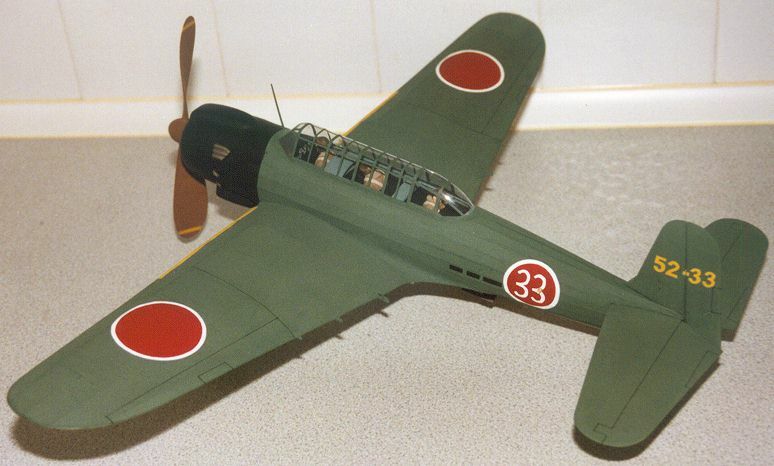 Nate's design is very accurate, compared to published Japanese drawings, and the model featues scale dihedral and a scale fin size with just the tailplane enlarged a bit to help longitudinal stability. One change I made from the plan was to devise a plug-in landing gear, so that at some stage I could have a go at flying the model "wheels up" with the torpedo hung underneath. 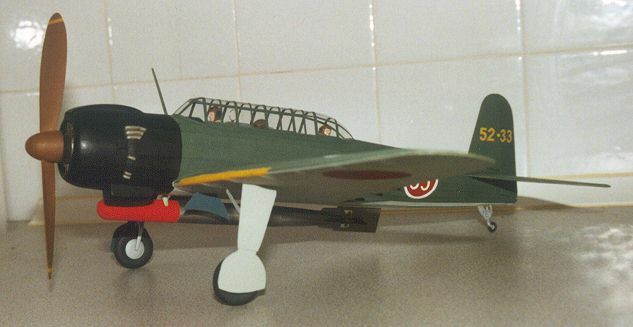 This latter was copied from the design included in the Dave Diels Aichi Grace kit (which will make a nice companion to the Jill, if I ever get round to building it!) The torpedo is held onto two of the cradles with pairs of 3 mm dia neodymium magnets. The model is finished in my usual way, with Japanese tissue, and Humbrol enamels thinned with cellulose thinners. all markings are airbrushed. The canopy framing is done using strips cut from painted decal film (lots of them!) I use a Peck plastic prop for flying (the spinner is balsa). Final weight was 62 g including noseweight, but no rubber, which is rather more than I would have liked. There is still work to do on the trimming - it prefers to turn right (presumably because the right wing has less washout than the left) and seems stable enough - just very underpowered with a loop of 1/4" rubber (lands with half the winds still on). Best time so far is a mere 13 seconds, but with more grunt I am sure it will perform well. I am going to try 2 loops of 0.135" rubber next time. In contrast to the Tenzan, here is my 25" span Davis D-1W from the old (pre-war) Comet plan. The structure is nice and light, though I did change the wing spar arrangements. The design has a single 1/8 x 1/16" spar on the bottom (which would have been prone to warping) so I split this into two 1/16" sq. spars, one at the top, one underneath. I also put in a second upper 1/16" sq. spar half way between the first spar and the leading edge. I added more reinforcement around the strut locations, and made the undercarriage springy by not attaching the wires to the balsa legs (the wires run inside the legs, so you can't see them). I also enlarged the stab slightly, by building around the outline, winning 1/16" all round. It still doesn't look huge though. The rudder is separate and hinged with wire, to aid trimming. 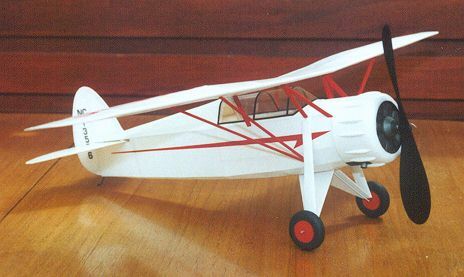 Cowling is a 1/16" balsa wrap, rather than the suggested notepaper, and I put some relief cylinders up front instead of the paper cutout. The canopy is a spare from Golden Age Reproductions, who kit this plan as part of their range. 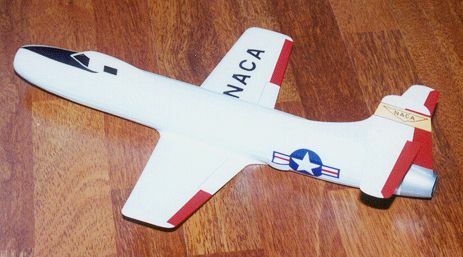 The model made its first flights at the Peterborough Flying Aces meeting, September 2002, in perfect flying conditions. Happily if flew almost straight off the board, just needing a little nose weight to stop gentle stalling. I adjusted the rudder to give a gentle left turn, and then an extra 1/64" downthrust to stop power stalling when the number of turns was ramped up. 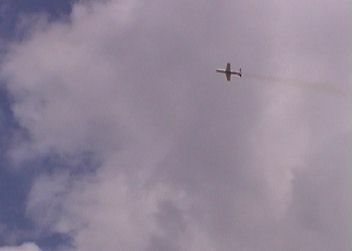 Using a loop of 1/4" rubber, a very satisfactory climbing flight pattern was obtained, and the final fight was timed at 49 seconds (about 1000 winds). Stability is impressive, considering that wing tip dihedral is only 1/2" per side. If only all models were as easy as this to trim!